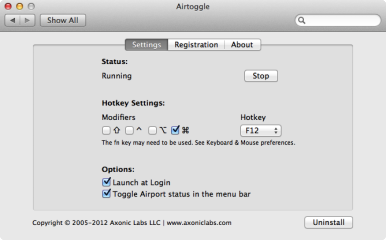 Two and a half years later, Axonic Labs, the developer of Bluetoggle, has obliged—Airtoggle is the AirPort (Wi-Fi) equivalent. 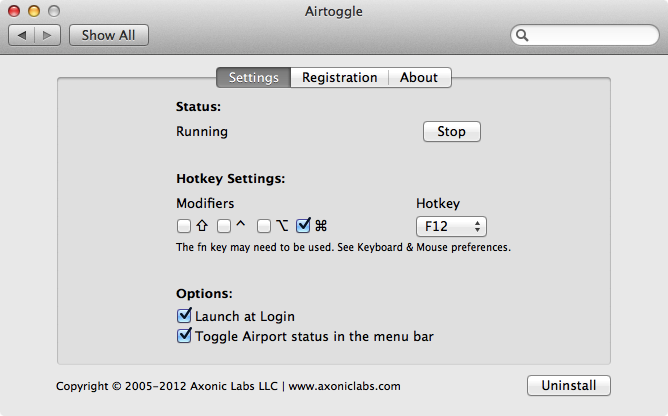 Open the Airtoggle System Preferences pane, and you can choose your preferred keyboard shortcut: any function key (F-key) along with any combination of Shift, Control, Option, and Command. I chose Command+F12 on my MacBook Air. You can now press that keyboard shortcut at any time to toggle Wi-Fi on and off; a semi-translucent Wi-Fi graphic appears on the screen to confirm the action. Airtoggle doesn’t affect how OS X’s Wi-Fi feature connects to networks—when you enable Wi-Fi using Airtoggle, OS X uses the same procedure for joining networks as it would if you’d enabled Wi-Fi using the Wi-Fi menu or Network preferences. For many people—especially those using laptops with crowded menu bars—the best part of Airtoggle is that you can easily disable and enable Wi-Fi without having to keep Apple’s Wi-Fi menu extra enabled. Alternatively, a nifty Airtoggle option can automatically hide that Wi-Fi menu whenever you disable Wi-Fi, and display it whenever Wi-Fi is on. In other words, if you’re not using Wi-Fi, you won’t see its status menu. One drawback of this feature—and it’s not something the developer can control—is that whenever you turn on Wi-Fi, the menu extra appears as the left-most of the stock (Apple) menu extras. If you prefer that it reside farther to the right, you’ll need to manually move it. The only other issue I had with Airtoggle was one that likely won’t affect most users. While testing the program, I used the Airtoggle shortcut to quickly toggle Wi-Fi on and off multiple times. Two of the times I put Airtoggle through this (admittedly non-real-world) test, it caused SystemUIServer, the OS X background process that handles menu-bar apps and menu extras, to crash. Of course, SystemUIServer automatically relaunches if it crashes, so there was no harm done. And few people will tax Airtoggle of SystemUIServer this way. If you frequently toggle Wi-Fi on and off—say, to prolong battery life, or for extra security while out and about—and you’ve ever wished you could do so using the keyboard, Airtoggle is a handy utility. The fact that it can also free up some menu-bar space on your laptop’s small screen is a nice bonus.